Le-Vanguard: Dimension Police:Metalborg deck profile. Hi, I am back with another deck profile and sharing from my experience of using Metalborg Sin Buster deck. Here is the decklist that I am playing with. I got 2 Words 2 describe this deck. My question to readers/cardfighters: Which is Deadlier? Restricted to guard with grade zeros or restricted to guard with grade ones and above? My answer would be being restricted to guard with only grade zeros only coupled with vanguards that swing for huge numbers are a deadly combination. [AUTO](VC):When this unit attacks a vanguard, if this unit is in Legion, and this unit's [Power] is 30000 or greater, until end of that battle, your opponent cannot call grade 1 or greater units from hand to (GC). 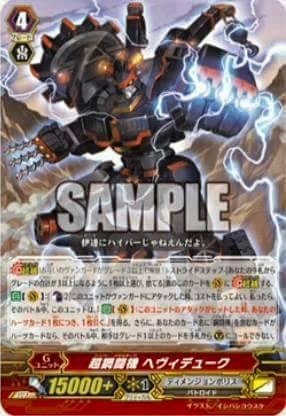 [AUTO](VC):When this unit attacks a vanguard, if this unit's [Power] is 20000 or greater, until end of that battle, this unit gets "[AUTO](VC):When this unit's attack hits, draw a card.". Hitting 30000 or greater is an easy task to fulfil in dimension police. Not to mention it triggers its other ability as well in conjunction with the guard restriction ability to restrict your opponent from guarding with grade ones and above. This ability allows Sin Buster to filter out all the perfect guards from being placed on the guardian circle. Guarding a Sin Buster would cost the opponent 3 10000 shields would render a No Trigger Pass for the attack to go through. Not to also forget 2 more 10000 shields for 2 rearguard columns. This means they would need 3 cards to guard the vanguard and 2 cards for the rearguard to maintain not taking damage this turn. To cut the long story short, you would need 5 10000 shields guard all of its columns. Normally people wouldn't bother to guard for Sin Buster which normally earns you the +1 hand advantage over your opponent which also makes them vulnerable to wild critical triggers that showed up during the drive check. This deck is consistent with its new support Metalborg, Barrengrader. [ACT](VC):[Counter Blast (1) & Soul Blast (1)] Search your deck for up to one grade 3 card with the Legion ability, ride as [Stand], shuffle your deck, choose one of your vanguards, and it gets [Power]+3000 until end of turn. 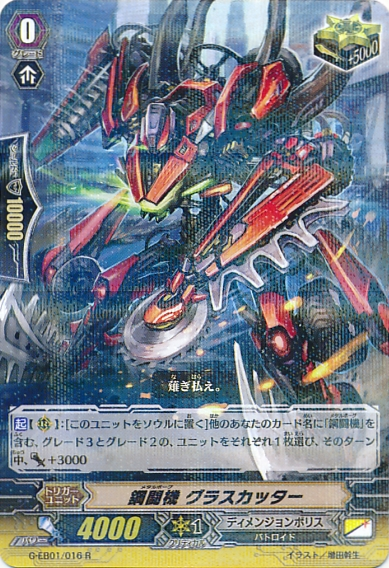 [ACT](RC):[Soul Blast (1)] If you have a vanguard with "Metalborg" in its card name, this unit gets [Power]+2000 until end of turn. This card has a special ability to superior ride a grade 3 unit with Legion ability which allows him to tutor out a Metalborg Sinbuster from the deck. Its cost of soul blast, allows him to set up for performing legion. By pulling off this combo, you easily filter out 2 cards from the deck if you are performing legion this turn. His second ability allows the quick dumping of souls to the drop zone which helps assist Metalborg Sin Buster to legion with ease and to also hit for higher numbers. [ACT](RC):[Put this unit into your soul] Choose one of your other grade 3 and grade 2 units with "Metalborg" in its card name, and those units get [Power]+3000 until end of turn. Grass cutter has a decent effect of powering up 2 separate units, 1 of grade 2, the other of grade 3. Preferably you would usually use its ability to power up your legion to hit perfect numbers of either 33000 or 36000, it ability can also be used to buff rearguards as well. The objective of this deck is to outlast your opponent and to hit high numbers with Sin Buster to prevent them from guarding, then pull crits to get all that damage through. The key card to make Sin Buster work consistently is Metalborg, Black Doctor, a 10K booster for the Vanguard. The Legioned Vanguard is already 20K on its own, so a 10K booster would spike the power to 30K, instantly activating Sin Buster's skill. Another notable feat of this deck would be the tagging of Commander Laurel as your rearguard. It turns sin buster to a beast which helps you gain massive card advantage over your opponent. [AUTO](VC):[Counter Blast (2)] When this unit attacks a vanguard, you may pay cost. If you do, until end of that battle, this unit gets "[AUTO](VC):When this unit's attack hits a vanguard, draw a card for each of your heart cards.". 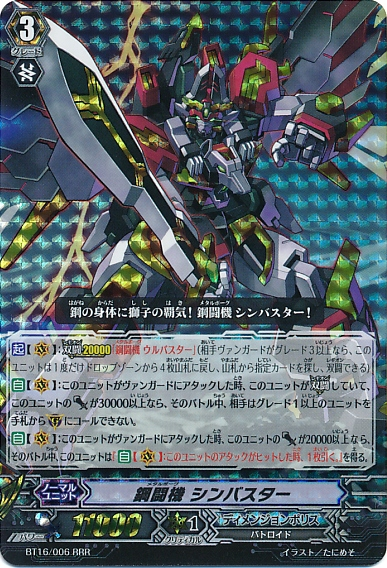 Then, if you have a heart card with "Metalborg" in its card name, until end of that battle, your opponent cannot call grade 1 or greater cards from hand to (GC). 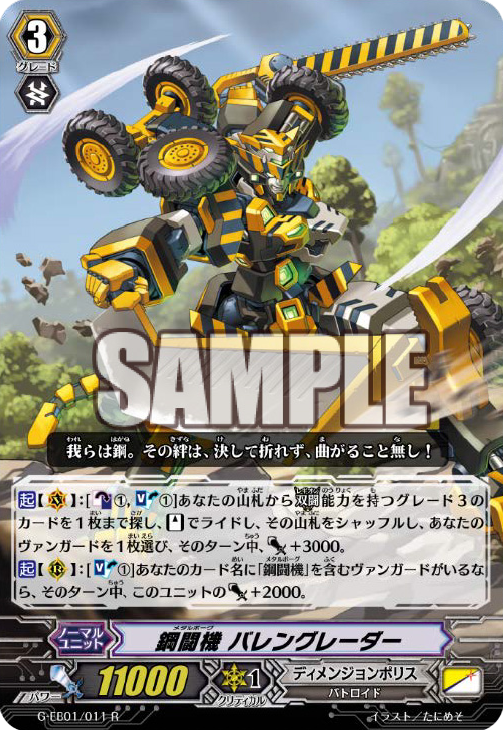 Heavy duke would be the real beast of the deck, unlike Sin Buster, it doesn't need to be at 30k power to have its guard restriction. It also has the added draw for each heart it has. This is just to rub the salt to the wound after pressuring with Sin Buster. This card allows metalborg to overextend its shenanigans and gives you a net +2 advantage when this card hits your opponent's vanguard. Coupled this with the Notorious Commander Laurel would just made this card an unrivalled monster. Giving a +10 handsize advantage if your opponent is ever going to let him hit the vanguard twice. In short, this deck is pretty straight forward to use and its pretty monstrous too with the pressure it puts on the opponent. Note: I don't own any of the images above. Credits to their respective owners and Bushiroad Inc.